Abstract: Nowadays, every robot is done with the help of the microcontroller, and hence the circuit is too big and tough to understand. For that reason, this Intelligent Line follower robot is developed with a simple concept. This robot is a mobile device that detects and follows the line drawn on the floor. The path must be in a visible black line on a white surface. Introduction: A line following robot is a mobile machine employed to sense and follow the black lines that are drawn on the white surface. 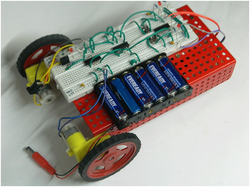 As this robot is developed using a breadboard, it will be very simple to construct. This technique can be incorporated into the Automated Guided Vehicles (AGV) for providing the easy way of operation. Generally, the AGV is integrated with the microprocessor and computers for controlling its system. It also uses a position feedback system for traveling in the desired path. In addition, the electric signals and RF communication are needed for communicating with the vehicle and system controller. Such awkward functions are completely not required in this line following robot, and it just uses the IR sensors to travel on the black lines. Battery: This robot is powered by a battery. One 9V battery is enough to perform this process. For more usages, four 9V batteries may be required. 12V DC motor: If a DC power is passed on a DC motor, it will produce torque. The torque created will lead to the rotation of the wheels. It will only operate on the direct current. Here, two 12V DC motors are used. Breadboard: A breadboard includes several numbers of holes in which the upper and bottom holes are interconnected horizontally to each other, while the other holes in the center are vertically connected at the base. It does not require any sort of soldiering works and therefore the components can be used again. Two plastic wheels: The plastic wheels will be connected to the DC motors. As soon as they create the torque, these wheels will help the robot to move. Castor wheel: The castor wheel is used to make the movements easy and quick even it has large components on its top. In this process, a small stainless steel castor could be the best one to use. IR sensor circuit: This process requires two IR sensor circuits. An IR sensor circuit will include an IC LM358N, potentiometer, IR receiver, and IR transmitter for sensing the black lines. Battery holder: It is used to connect the battery with the breadboard. Capacitor: It helps in storing the current, equalizing the power output, filtering, and more. This robot makes use of two 10uf capacitors. Resistors: It is incorporated in such areas where there is a need of reduced voltage. There are various ranges of resistors available. It can be measured either by means of Multimeter or calculation of colors. IC LM358N: It is an operational amplifier or comparator used to evaluate the voltage current. The high amount of voltage gained will be considered as the output. It is one of the main components of an IR sensor circuit. IC 7805: The output given from the battery to the circuit is 9V. In this process, 5V of power supply is sufficient to operate. For that reason, an IC 7805 voltage regulator is used to control the high amount of voltage. IC L293D: It allows the DC motor to run in both front and back directions. It consists of up to 16 pins. Multimeter: This device is mainly used to check the range of resistors, battery, and so on. Wires (four-core & two-core): Four core wires are implemented for connecting the motor drives, and the two core wires are used to connect on the breadboard. Two meters of each wire will be required. LED: The glowing of the LED makes sure that the current is flowing in the circuit. If the LED does not glow, it is considered that there is some problem with the connection. 9V battery is connected to the breadboard via a battery holder. The positive power supply is passed to the IN of IC 7805 (1), and sent out through the OUT (3). The negative power supply is sent to the GND (2) connection of IC 7805. In between, two capacitors (C1 & C2) are connected to the IN and OUT of IC 7805 respectively. As a result of this process, 5V of current is obtained. Subsequently, an IC L293D is placed in the breadboard. The first 12V DC motor four – core wire is connected to the 3rd & 6th pin of IC L293D, while the second is attached to 11th & 14th pin. The two plastic wheels are connected together with the motors. Additionally, a castor wheel is included at the front of the robot for balancing and as well as for making quick movements. The 1st, 8th, 9th, & 16th pins are given the power supply of 5V. The 2nd & 15th pin are integrated with the two IR sensor circuits. Now, connect the battery to the circuit, and place the robot on the black lines of the white surface. The IR sensor will start sensing the black lines, and travel on it as it is drawn. 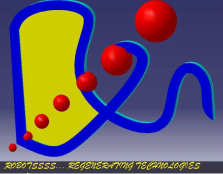 A most advantage factor in this project is that it can be developed within rs 600/- only.!! These robots can also be developed with the help of a micro-controller. However, the connections made will be very complex to understand even for the professionals. 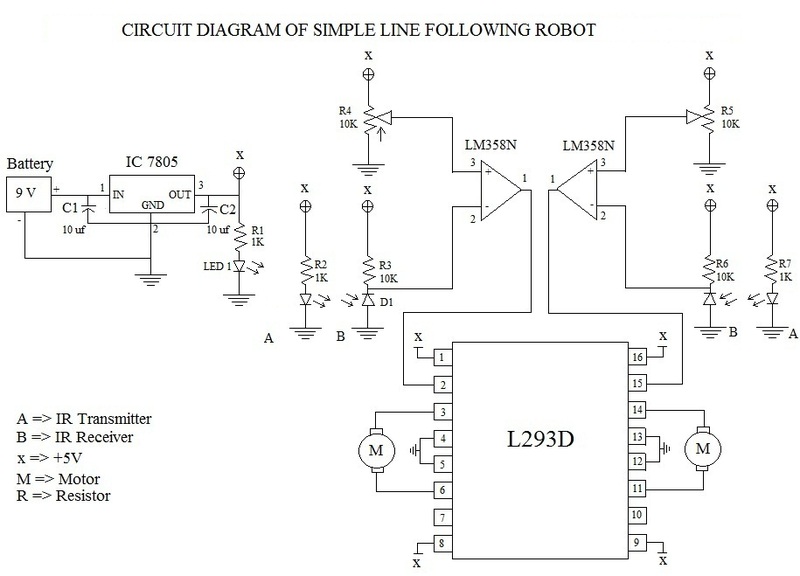 As a result, this simple line following robot will certainly make you easy to assemble the components by just observing its circuit diagram.